Canada customer are about to receive a new LG touchscreen feature phone; LG T320 (LG Flick) A new LG touchscreen feature phone is about to be launched in Canada: the LG T320. 3G, a 2.8 inch QVGA touchscreen display, Cartoon UI, virtual QWERTY keyboard, push email, stereo Bluetooth, 3.5mm headset jack, music player, FM radio, 2MP camera, and MicroSD card support. 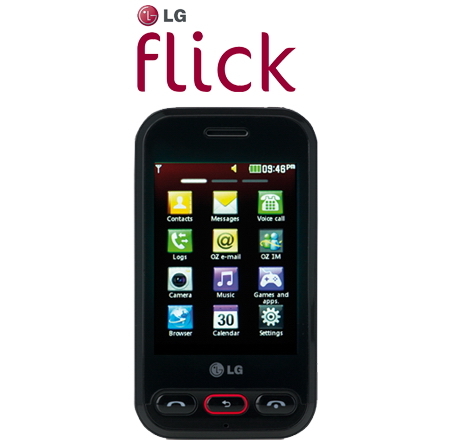 You can visit LG Canada's website for more info on the LG Flick. No wording on pricing or which carrier will offer the LG Flick as of yet. Wtt: Lg Vx-8000 For........... ???? Is there a cellular plan for Canada?